Dorothy Ann Mueller, 91, of Hamburg, died Thursday, March 3, 2016, at the Auburn Home in Waconia. Honorary casket bearers are Katie Mueller and Dr. Charity Kranz. Casket bearers are Joe Mueller, Tim Mueller, Karl Kranz, Luke Zabel, Ben Otto and Pat Otto. Interment will be in the church cemetery. 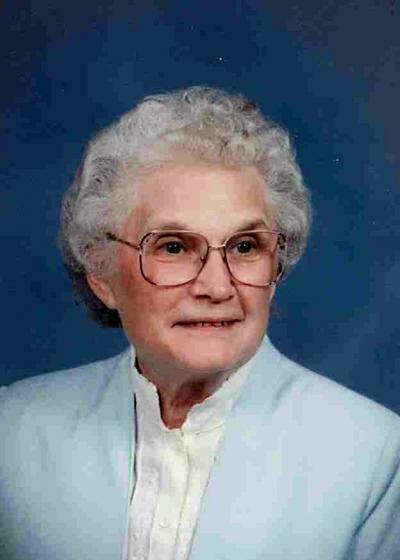 Dorothy Ann (Prehn) Mueller was born Aug. 30, 1924, at her home in Bergen Township, McLeod County, the daughter of Fred and Sophie (Engelmann) Prehn. She was baptized as an infant on Aug. 30, 1924, by the Rev. R. Zwintscher at her home, and was confirmed in her faith as a youth on April 10, 1938, by the Rev. R.L. Ehlen at St. John’s Lutheran Church in Plato. She received her education at a country school near Plato, and then graduated from Glencoe High School with the class of 1943. On May 9, 1948, she was united in marriage to John “Jack” Mueller by the Rev. C.E. Mix at St. John’s Lutheran Church in Plato. They made their home in Hamburg until 2014, when they moved to Peace Villa in Norwood Young America. Their marriage was blessed with three children, Larry, Joyce and Karen. They shared over 67 years of marriage. Before Mrs. Mueller met her husband, she began working at Strutwear in Glencoe. After marriage, she worked alongside her husband in the family grocery business, retiring in 1986. During her retirement, she worked at Young America Corporation in Norwood Young America. She was a member of Emanuel Lutheran Church in Hamburg, where she loved to volunteer and sing in the church choir. Mrs. Mueller enjoyed gardening, sewing, baking and bowling with her husband in couples leagues. She cherished the time spent with her friends and family, especially her children, grandchildren and great-grandchildren. She is survived by her husband, John “Jack” Mueller of Norwood Young America; children, Larry Mueller (wife Barb Peterson) of Eden Prairie, Joyce Zabel (husband Bob Shanahan) of Norwood Young America and Karen Otto of Waconia (friend Bill Sletten of Ostego); grandchildren, Joe (Meg) Mueller of Shakopee, Tim (Megan) Mueller of Edina, Katie Mueller of Edina, Dr. Charity (Karl) Kranz of Lexington, Kentucky, Luke (Amber) Zabel of Mankato, Ben (Kristin) Otto of Waconia and Pat Otto of Waconia (special friend Hania Pokora of Edina; great-grandchildren, Kaylee Otto, Brayden Otto, Braxton Otto and James Mueller; sisters-in-law, Doreen Kloth of Eden Prairie, Gloria Trittabaugh of Hutchinson, Helene (Delford) Olson of Bemidji, Luella Prehn of Lester Prairie and Orvilla Prehn of Glencoe; nieces, nephews, other relatives and friends. She was preceded in death by her parents, Fred and Sophie Prehn; son-in-law, Bob Zabel, brothers, Harold Prehn and Marvin Prehn; sister, Lorna Matthews; and brothers-in-law and sisters-in-laws, Marvel (Frank) Holicky, Stan Koth and Glen Trittabaugh. Arrangements are with the Paul-McBride Funeral Chapel in Norwood Young America. Online obituaries and guest book are available at www.hantge.com.